Black Garlic can be eaten straight from the pack. It is amazingly sweet and caramelly yet has all the goodness of Garlic. Famously this new superfood, snack and cooking ingredient has up to twice Garlics anti oxidants and absolutely none of the smell so is a great way to get your daily dose.On top of all that the ageing process brings out a new anti carcinogen, S-Allycysteine, which is not found in regular garlic. Black Garlic, Garlic just got better. Versatile for cooking and snacking .....a perfect superfood. "Rarely does a truly novel ingredient come along, so when Aged Black Garlic hit the scene, chefs took notice"
With no additives or preservatives there are no other ingredients in aged Black Garlic other than Garlic. White Garlic is aged for a month in a special fermentation process under high heat, where it develops it&apos;s darker colour, softer texture and sweeter taste.. and loses it&apos;s well known after smell! 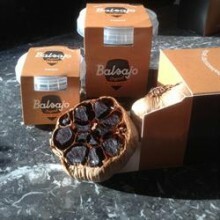 Click the button below to add the Black Garlic Peeled Black Garlic Tubs 150g to your wish list.